Born - 13th January 1971 Dunfermline,Scotland. Previous Bands - Iron Hoarse, Dougie McClain Band. Favorite Nazareth Song - I love the songs from Malice in Wonderland and Gimmi what's Mine' from the Expect no Mercy album.. Favorite Drummer - Ronnie Dalrymple. He gave me my first lessons. Favourite Food - Hot Curry. Favorite Drink - Pint of Blackthorn Cider, or Milk. Best Thing About Being in Nazareth - Getting to see a bit of the world. Which City is the Rock 'n 'Roll Capital of the world - Get back to me in five years. Nazareth will keep on Rocking Because - There Bloody Mad. День рождения — 13 января 1971 года. Ли — сын басиста Пита Эгнью, родился в шотландском городе Данфермлайн. 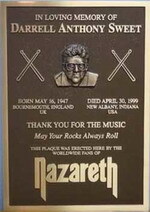 Присоединился к Nazareth — осенью 1999 года. До Nazareth — Ли был участником групп Iron Hoarse и Dougie McClain Band. Любимая песня в Nazareth — я люблю песни из альбома Malice In Wonderland и песню Gimme What's Mine из альбома Expect No Mercy.